On her birthday, Diana posted a poignant excerpt from THE FIERY CROSS on her blog, which features tender moments between Jamie and Claire. 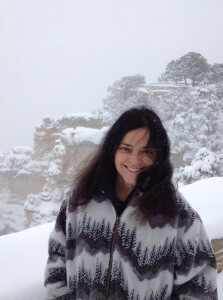 And read an essay first published in 1999, “Myth and Mountain Birthdays.“ Diana shares the extraordinary love story of her mother and father, and her birth in northern Arizona. On January 2, Diana sent her Best Wishes to her readers for the New Year in a blog post. But she also shared some sad news. The Third Day of Advent (December 17, 2018), which features an excerpt from THE FIERY CROSS. The Fourth Day of Advent (December 23, 2018), which features an excerpt from THE SCOTTISH PRISONER. 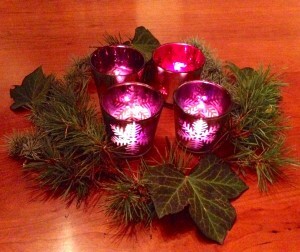 The Fourth Day of Advent (December 23, 2012), which features an excerpt from WRITTEN IN MY OWN HEART’S BLOOD. Happy 50th (!!!!) episode to the OUTLANDER TV show! And how better to celebrate than to watch Episode 408—“Wilmington”—and discuss it with your friends? So put aside your present-wrapping for a moment and enjoy the latest Happening (and quite a LOT happens in this one. Boy, Howdy, as my good friend Walt Longmire is prone to say…). As always, ANY opinion is welcome, and naturally everyone will be civil and kind in their reception of opinions differing from their own, because it’s the season of peace and good will—and because we are Outlander readers and fans (and hence, literate, well-educated, compassionate and considerate). On October 23, 2018, Penguin Random House released a beautiful, new, lavishly produced hardcover edition of VOYAGER, on the 25th anniversary of its first publication. 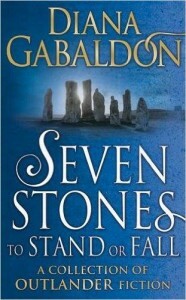 It is the third major novel in my OUTLANDER series. Click here if you’d like to purchase a copy of this special edition signed by me from the Poisoned Pen bookstore, who will ship anywhere in the world! There is no extra charge for my signature. All excerpts for BEES are always listed by temporary title on the right-hand side of my official GO TELL THE BEES THAT I AM GONE webpage. I release them at irregular intervals. Excerpts from are listed by a TEMPORARY TITLE. These titles are to help you tell one excerpt from another and to give an idea what they are about; these excerpt titles will NOT be used in my finished book. Note that these sample excerpts of my new book may contain minor spoilers. Trade Paperback Edition of SEVEN STONES is Released! Click here for more information about the trade paperback edition on my blog. To read excerpts from the seven stories in this book, click here visit my SEVEN STONES webpage, which has pull-down menus with online buying links. It is also available in hardcover, and e-book formats. New copies of the U.S. trade paperback edition of SEVEN STONES signed by me are available from the Poisoned Pen Bookstore’s online store; the Pen ships anywhere in the world! My signature is included at no extra charge on all of my books purchased from the Pen. Click here for more information about ordering my books from the Poisoned Pen. On Tuesday, June 12, 2018, I posted a new, short excerpt (aka “Daily Lines” entry) from BEES. Click here to read this new excerpt, which has the temporary title of “Crudely Calibrating.” The temporary titles used for excerpts are used to list them on my webpages so readers can tell them apart, and will not be used in the book. 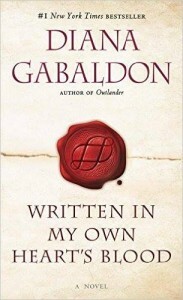 I am currently writing and researching this ninth book in my OUTLANDER series of novels. 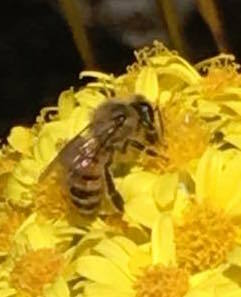 The GO TELL THE BEES THAT I AM GONE webpage has links to other excerpts from my new novel. BEES will probably be finished and then published some time in 2019. Are you waiting for you own copy of Season 3 of the Starz Outlander TV series? Sony International has shared dates for release of Season 3 in Blu-Ray, DVD, and Digital formats for many countries around the globe! Please click here to view the global release dates. Note that some countries or regions will be announced in the future. 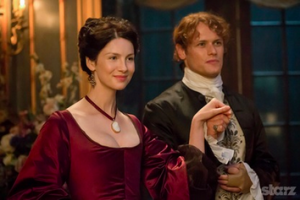 March 24, 2018: Cinema Blend reports that season three of the Starz Outlander TV series (which premiered last fall in the U.S.A.) will be released on DVD, Blu-Ray and as a digital download beginning on April 10, 2018 in the U.S. Image at upper right is the cover for the Collector’s Edition of Season 3, to be sold in the U.S.
On March 6th, 1988, I started writing a book for practice. That turned out to be OUTLANDER, and now look where we are….! Click here to visit my webpage for GO TELL THE BEES THAT I AM GONE, book nine of my OUTLANDER series of novels, which has more information and links to excerpts from this new book. “Bears,” from January 19, 2018. 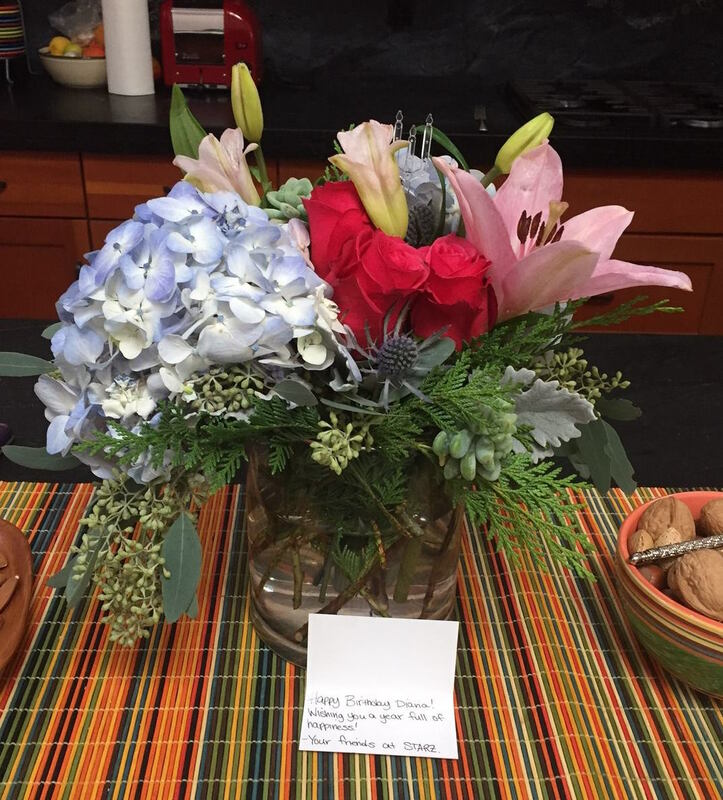 “A Small Gift In Honor Of My Birthday,” from January 11, 2018. “A Hunting We Will Go,” from November 24, 2017. “My Father?” from Thanksgiving Day, 2017. “A Bit of Trouble,” from November 11, 2017. More excerpts are linked to my official webpage for GO TELL THE BEES THAT I AM GONE. Excerpts are listed by their temporary titles, which help describe what each is about (but are not chapter titles or anything like that). In the image at right, I am enjoying Thanksgiving with my grandson and family pups. 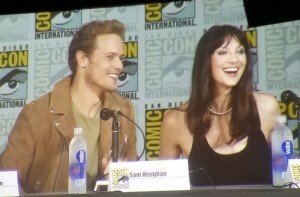 “Watch Outlander’s cast dance-filled SDCC panel with Jenna Dewan Tatum.” Posted by the LA Times on July 21, 2017. Image is by the LA Times. 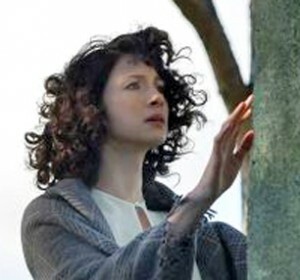 Click here to read “Taking Leave,” a new excerpt from GO TELL THE BEES THAT I AM GONE, Book Nine of my OUTLANDER series of novels. This excerpt, one of my Daily Lines, was first posted on my official Facebook page on June 23, 2017. Read “Bedizened Head,” a new excerpt from Book 9, GO TELL THE BEES THAT I AM GONE. It was first posted on my official Facebook page on June 8, 2017. Remember that my excerpts (“Daily Lines”) contain SPOILERS! SEVEN STONES released on June 27, 2017! Alrighty, then! 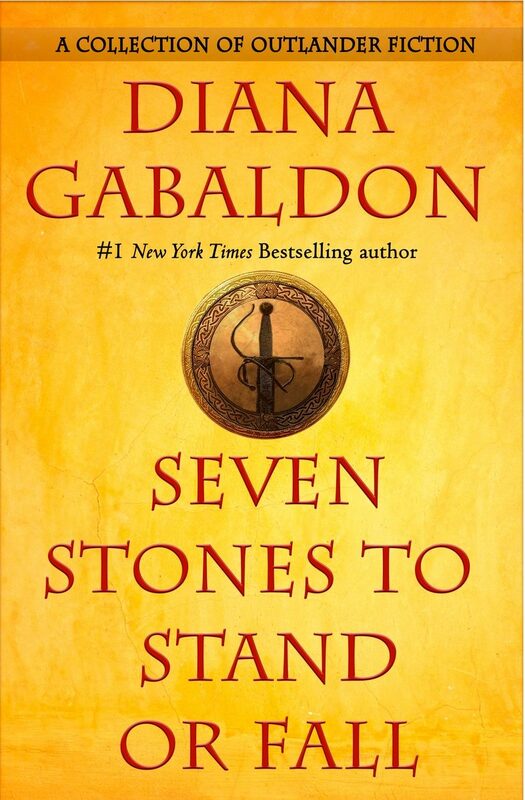 Penguin Random House (U.S. and U.K.) and I are delighted to announce that SEVEN STONES TO STAND OR FALL comes out June 27th! Read more in my blog from June 7, 2017, including a new excerpt, titled “Scalps,” from one of my stories in SEVEN STONES! Catriona Balfe – 2017 Golden Globe Nominee! Congratulations to Catriona Balfe! She was nominated for “Best Performance By An Actress In A Television Series – Drama” for her portrayal of Claire Beauchamp Randall Fraser in season two of the Starz Outlander TV series, which is based on my OUTLANDER novels. On January 8, Claire Foy (The Crown) won the category at the awards ceremony. 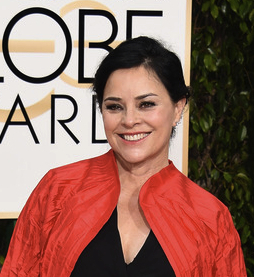 This was the fourth Golden Globes nomination for the first two seasons of the Outlander TV series (Starz). For season one a year ago: the Outlander series was nominated for “Best Television Series – Drama”; Catriona Balfe was nominated for “Best Performance By An Actress In A Television Series – Drama” the first time; and Tobias Menzies was nominated for “Best Performance By An Actor In A Supporting Role In A Series, Limited Series or Motion Picture Made For Television” for the dual role of Black Jack Randall and Frank Randall. Many critics of the series have felt that the show should receive more acclaim, and viewers have been especially disappointed that Sam Heughan has not been nominated for a Best Actor award for his portrayal of Jamie Fraser. Click to view a nice video interview with Caitriona from TheWrap, which also includes some preview information for season three. In her blog, “SEVEN STONES in 2017,” released on November 28, 2016, Diana discusses antsy readers who “just can’t wait (! )” for Book 9, GO TELL THE BEES THAT I AM GONE, and how their please, anxiety and evem worries that they won’t live to see the next book do NOT help her write any faster. Also, Diana announces that, although BEES will not be published in 2017, SEVEN STONES TO STAND OR FALL will be released in April. 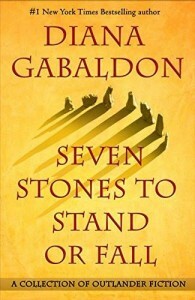 SEVEN STONES is a collection of five previously published works of short fiction from the Outlander universe, and it will also contain two brand-new works of short fiction. The ninth book in the OUTLANDER series now has a title: GO TELL THE BEES THAT I AM GONE. 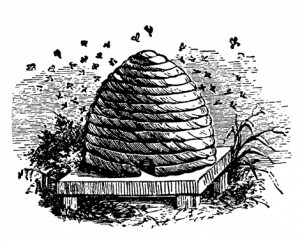 Talking to your bees is a very old Celtic custom (known in other parts of Europe, too) that made it to the Appalachians. 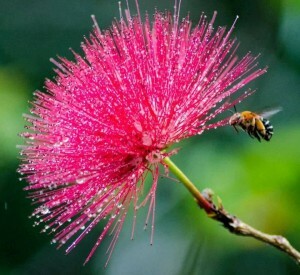 You always tell the bees when someone is born, dies, comes or goes—because if you don’t keep them informed, they’ll fly away. 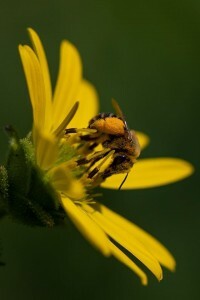 Click here for news and excerpts from GO TELL THE BEES THAT I AM GONE. New excerpts recently added are "Taking Chances," and "Domestic Economy." Episode 211: Script by Diana! 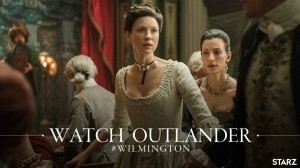 The Outlander TV series episode 211, “Vengeance Is Mine,” will air on June 18 on Starz in the U.S.A., and is special because Diana Gabaldon wrote the script for the episode! She spent a month in Scotland as it was being filmed. (Script authors have to be on hand as an episode is being filmed.) See: ’Outlander’s’ stars thrill to the writer’s presence on set, by Yvonne Villarreal for the Los Angeles Times. Published on June 9, 2016. The second season of the Outlander TV series concludes on July 9 in the U.S.A. at 9 p.m. on Starz. It will be a 90-minute episode, instead of the usual one hour, and is titled “Dragonfly in Amber” after the second book in the OUTLANDER series of novels. Before the season finale, Starz will show a marathon of the first 12 episodes from Season Two. Spoiler: The season 2 finale will introduce Brianna (played by actor Sophie Skelton), the daughter of Claire and Jamie, and an adult Roger Wakefield (Richard Rankin). Outlander Kitchen Cookbook Release and Party! 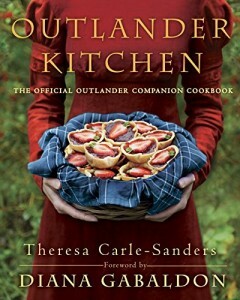 Outlander Kitchen: The Official Outlander Companion Cookbook, by Theresa Carle-Sanders will be released in the U.S. on June 14, 2016! It will be available from your favorite independent bookstore or online from the usual sources. 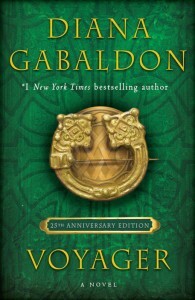 A special book release party featuring Theresa and Diana Gabaldon will be held in Scottsdale, Arizona on June 25, also! Come and hear them discuss this new book. A hardcover copy of this new book signed by Diana and Theresa will be included in your event admission ticket ($40)! See my officialappearances page for more information on this event! The Poisoned Pen bookstore is hosting this celebration. Note that the event is limited to 500 attendees, so buy your tickets early. Seasons 3 and 4 Approved! Starz has announced that both seasons 3 and 4 have been approved for the Outlander TV series! Live in Southern California? Or are you going to visit the L.A. area this summer? 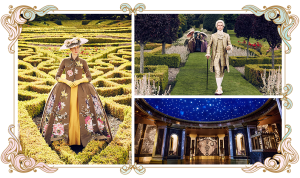 Don’t miss "The Artistry of Outlander, An Exhibit of Costumes and Set Designs," showing at the Paley Center in Beverly Hills, California, from June 8 to August 14, 2016. The exhibit is free and open to the public. Hours are Wednesdays to Sundays from Noon to 5:00 p.m. (Closed Mondays and Tuesdays.) The Paley Center, 465 North Beverly Drive, Beverly Hills, California. Exhibit description: "The Artistry of Outlander will take visitors into the world of the critically acclaimed STARZ and Sony Pictures Television series Outlander, showcasing many iconic costumes designed by Emmy-winning costume designer Terry Dresbach. Fans can step into 18th century Parisian society, where they will be able to view actual set pieces from Outlander production designer, Jon Gary Steele, life-size episodic photography, and behind-the-scenes video segments." New Paperback Version of MOBY – May 31! Well, here’s news! The mass-market (small size) paperback of MOBY (aka WRITTEN IN MY OWN HEART’S BLOOD (My Own Heart’s Blood = MOHB = MOH-B = MOBY. Geddit? Also it’s big and white…)) will be released in the U.S. on Monday, May 31, 2016! The suggested retail price is $9.99. This new version of MOBY will be available at your favorite independent bookseller, as well as online from the usual sources. Copies of this new edition of MOBY signed by me are available from the Poisoned Pen bookstore. Click here to see this edition of MOBY and others available from the Pen. The Poisoned Pen has most all of my titles and editions in stock, and they ship anywhere in the world. Requesting a book with my signature from the Pen is no extra charge. There are lots of celebrations in the Big Apple from Monday, April 4th through Saturday, April 9th celebrating the broadcast premiere of Season 2 of the Outlander TV series! Events include red carpet events and panel discussions featuring the cast and crew of Outlander, Tartan Week, and finally the Starz global broadcast premiere of Season 2 in the U.S. on April 9! This excerpt was originally posted on my official Facebook page on Feb. 9, 2016. Season Two Debuts on April 9! If you live outside the U.S.A., click here for information on some viewing regions and countries around the globe. Binge On Season One For Free! 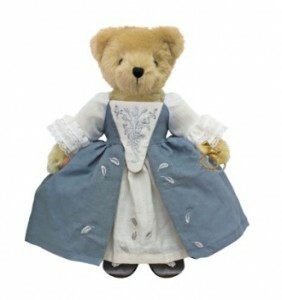 If you like OUTLANDER bears, a new wedding version of the Claire Bear was released by Sony on March 1! The Poisoned Pen is offering Claire Wedding Bears for sale with a special heart-shaped tag signed by me. Click here for more information about the Wedding Claire Bear, signed copies of my books, and other merchandise available from the Pen. Read more of this new excerpt on my blog. The Outlander TV series was nominated for three Golden Globe awards for Best TV Series (Drama), Best Actress (Catriona Balfe), and Best Supporting Actor (Tobias Menzies). Check out my blog on January 10, written before the ceremony started. 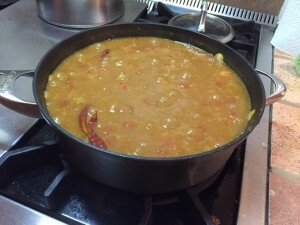 Recipe: New Year’s (and Christmas) Chile! What do you want to eat on New Year’s Day? Well, if you ask a Scot what the ideal breakfast is, to follow a proper Hogmanay piss-up, it’s a sausage square or bacon butty, washed down with a can of Irn-Bru. Originally posted on December 24, 2015. And enjoy a special excerpt from DRUMS OF AUTUMN—chosen by me especially for the holidays—in my blog post from Friday, December 25, 2015. Golden Globes! Roger Wakefield is Cast! Exciting news! The Outlander TV series was nominated for three Golden Globe Awards in mid-December, including Best Dramatic TV Series! Catriona Balfe was nominated as Best Actress and Tobias Menzies as Best Supporting Actor in a dramatic TV series. This News webpage lists selected news from the past few months about Diana’s books, writing, the Outlander TV series, and other projects posted here on her website, her social media pages, and in the news media. Included are new excerpts (aka "Daily Lines") from works in progress as well as special passages from her books and stories in print. Items are more or less arranged by date, with newer ones listed first. All text written in first person are Diana Gabaldon’s words. Third-person descriptive text is usually written by Diana’s Webmistress, who helps maintain the website updates. This page was last updated on Monday, January 14, 2019 at 7:55 a.m. (Pacific Time).